Sunday December 9 1883 I was at home all the forenoon at work and John and Hatt were over with the children in the afternoon I went home with them and staid till after supper. Rob came and we went to church in the morning. 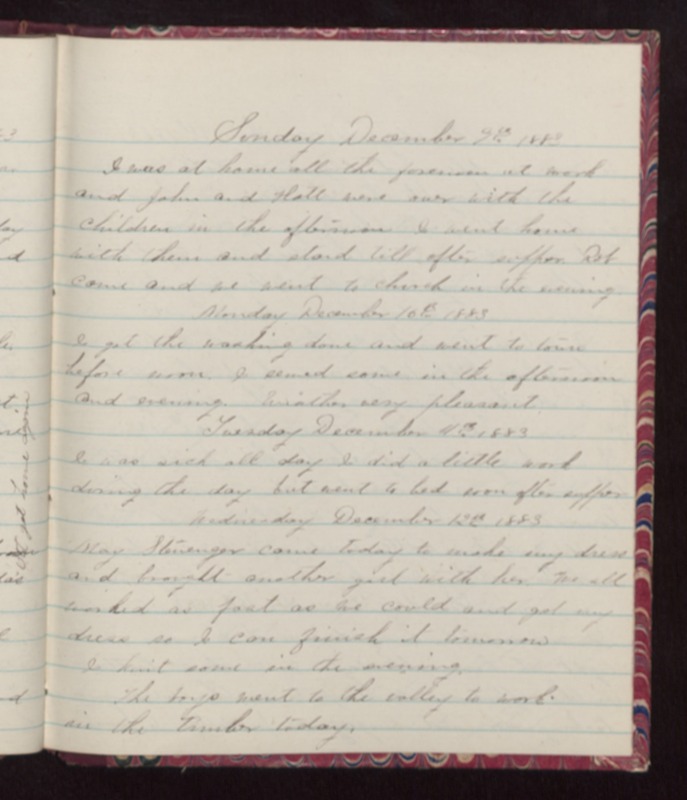 Monday December 10 1883 I got the washing done and went to town before noon. I sewed some in the afternoon and evening. Weather very pleasant. Tuesday December 11 1883 I was sick all day I did a little work during the day but went to bed soon after supper. Wednesday December 12 1883 May Stenenger came today to make my dress and brought another girl with her. We all worked as fast as we could and got my dress so I can finish it up tomorrow I knit some in the evening. The boys went to the valley to work in the timber today.